Home Holiday Christmas SNOW FOR CHRISTMAS! We don’t often have have snow for Christmas here, but it started snowing yesterday and we just managed to get to the airport and pick up my son who was flying in from Los Angeles before it got really nasty. My husband, Dean, learned to drive in West Virginia, so ice and snow don’t faze him, but we passed many cars that had skidded into the ditch or been abandoned in the middle of the road before we made it safely back home. By morning, we had about five inches and it kept snowing all day today. The grand kids, who live nearby, got the day off from school, so they came over to play in the snow with Uncle Nathan. 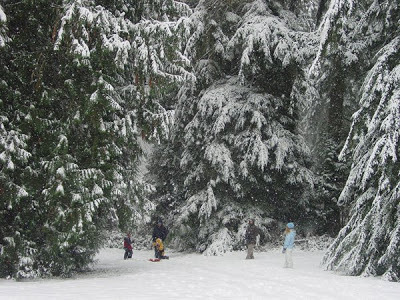 Our back yard is a great place for sledding, with a long steep path through the trees. I went out long enough to take pictures and then came in to get started on the Christmas baking and make hot chocolate and popcorn for the crowd when they came inside to warm up. School is cancelled for tomorrow too, so they’re coming back for their traditional visit to make gingerbread houses and help decorate our tree. It’s predicted to be down to 16 degrees tomorrow night with more snow in the forecast. We’ll make snow ice cream and have tacos for supper. 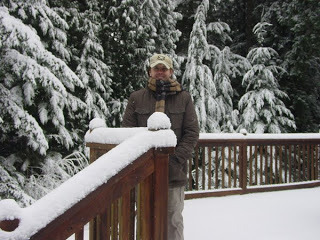 Nathan always hopes for snow when he comes to visit, but this is the first time it’s happened since we moved to Washington. Here he is on the back deck looking quite pleased. 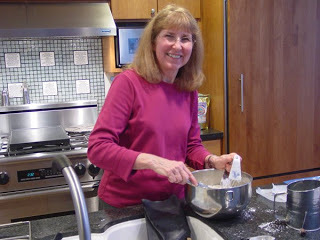 And here I am in the kitchen, as usual. It looks like our family will be having a picture-postcard holiday. Wishing you and yours a joyful holiday and a new year filled with health and happiness! “I’m (also) dreaming of a white Christmas” and Snow Ice Cream but it won’t happen it Atlanta. It finally quit snowing, but we have about 14 inches on the ground. I wish I could give you some! At least we didn’t lose our power as they did in some places.